The media this morning is dominated by yesterday’s Cabinet agreeing to the Prime Minister’s Brexit withdrawal deal. Specifically relating to the Home Office, business groups have claimed the Government’s promise to forge a global Britain after Brexit will be a “slogan rather than a reality” unless they allow the entry of low-skilled migrants. The FT’s story states that business leaders are concerned that EU nationals will no longer have priority in a future immigration system and those migrants who do come to the UK would be subject to strict salary thresholds. The paper notes concerns that if migrants needed to earn a minimum of £30,000 to be eligible for a Tier 2 visa there could be major labour shortages including in the construction and care sectors. The Sun carries a short article on claims the immigration White Paper will be published in the first week of December. We want an immigration system that works in the best interests of the UK and this means ensuring employers look to UK residents first before recruiting from overseas. We are engaging extensively with a range of businesses and stakeholders to make sure our future immigration system supports UK industry. The public have been clear they want controlled migration and we are considering the Migration Advisory Committee's recommendations before setting out further detail on the UK’s future immigration system. There is coverage in the Telegraph and Metro on a new tool to help combat child abuse online. The Metro reports that the ‘anti-grooming’ tool was created as part of the Home Secretary’s drive to tackle the crime. A prototype that can be used to flag up conversations between children and a potential groomer was developed at a ‘hackathon’ in the US last week. The Metro adds that engineers from Microsoft, Facebook, Google, Snapchat and Twitter, attended the event which was hosted by Sajid Javid and Microsoft. We all have a responsibility to tackle online child sexual exploitation and the new tool developed during the hackathon is a positive step forward. Once complete, it will be rolled out for free to other tech companies that want to deploy it. This is just one thing we can do together to combat this appalling crime. There is coverage in the Times, Independent, Mail and Sun on calls for hand car washes to be licensed to prevent gangs using trafficked workers. A report by the Environmental Audit Committee found that a “spectrum of exploitation” is taking place in car washes across the UK with workers, brought to the UK against their will, suffering trench foot and chemical burns whilst receiving illegally low pay. The Government is committed to tackling the abhorrent crime of modern slavery, which is why last year we gave the Gangmasters and Labour Abuse Authority new powers to investigate serious cases of labour exploitation across the entire economy, including in the hand car wash sector. The Government has commissioned an independent review of the Modern Slavery Act 2015. The Review will identify where the legislation is working well, how implementation can be improved and whether specific areas of the Act need to be strengthened including transparency in supply chains. The Times and Sun report on further attempts by migrants to reach the UK by sailing the Channel. Three boats with migrants on board were intercepted off the south coast yesterday, a day after another vessel was stopped, the Times reports. We are alert to the risk posed by people attempting to reach the UK illegally via small boats. This year we have increased the number of coastal patrol vessels and, in light of recent events, have stepped up deployments along the South-East coast. 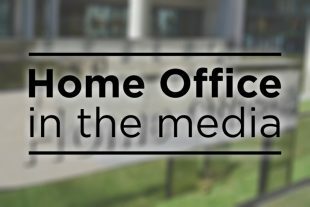 We continue to work closely with law enforcement partners in the UK and overseas to tackle people smuggling at source. Nobody should put their life at risk attempting to smuggle themselves into the UK across the Channel. Thankfully, this route to the UK remains relatively rare.